Cleaner hard drives means faster performance! 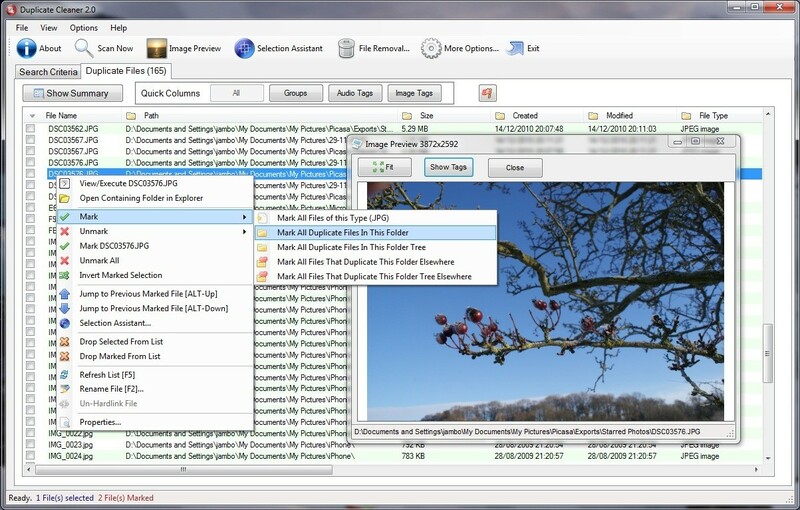 Save disk space by finding and deleting duplicate files on your hard drive or network. Duplicate Cleaner can find duplicate files, music (MP3, M4A, M4P, etc), photos, videos or documents - if it is duplicated on your system then Duplicate Cleaner will find it! It then offers you many ways in which to safely select and move,delete or hard link these files. Features: Lightning fast scanning, music and image scanning, selection assistant and more. * Find Duplicate Files by content, name, date or music tags. * Deep scans music - iTunes formats supported. * Intelligent Selection Assistant - helps you to select the files you want. * Search home or networked drives. * Search in multiple locations. * Export and Import results in CSV format. * View Path, Size and Date of files. * Large, resizable list window. * Delete duplicate files to the Recycle bin. * Move duplicate files to a new location. * Protection for Windows and system files. 2011-11-15 2.1 Major scanning engine update,bugfixes,Languages added.